Now that we're into October, it's not too soon to begin thinking about the holiday season. Most of us pleasurably anticipate Halloween, Thanksgiving, Christmas and other religious holidays because of special occasions with family and friends. However, others see the holiday season as an opportunity to steal from others through a variety of scams. These criminals want to take not only your money and possessions but also your identity and private information. Avoid fake charities. Before contributing, check that charity out through Charity Navigator or at the Better Business Bureau. Steer clear of bogus shopping sites. Yes, they're out there and they look just like the real thing. Always double-check the URL for poor grammar and misspellings. Avoid websites that have questionable contact information, unclear refund policies or unlikely prices especially those with incredible Black Friday deals. Be wise to phony family emergencies. You've probably heard about this one - a caller will pretend to be a family member in desperate need of money to get out of jail or catch a flight home. Check first! Ask the caller personal questions that your relative should know. Call another family member to be sure of the person's predicament, even if you've been asked to keep it secret. Don't use public Wi-Fi for banking or shopping. You may like the idea of taking a shopping break while getting coffee and using the shop's Wi-Fi to check your bank balance and order gifts online, but your private information can easily be hacked there. Prevent gift card fraud. The ever-popular gift card can be cloned and stolen and the accounts drained. Buy gift cards only from reputable dealers, and have the cashier verify the balance when activated. Hide your purchases. Don't leave gifts exposed in your car - cover them or lock them away in the trunk. Never load packages halfway through your shopping trip and then return to the mall - move your car to a different parking space. When placing cardboard boxes out to be recycled at home, turn labeled sides inside out and put them on the curb only on trash pick-up day. Never display travel plans on social media. You're just inviting criminals to investigate your empty home. 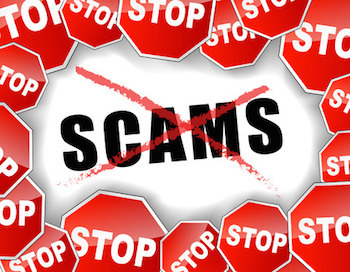 If you or a family member have been the victim of identity theft or a scam, the U.S. Federal Trade Commission's FTC Complaint Assistant can help. If you or a family member has been harmed in any type of personal injury, please contact the Law Offices of Diana Santa Maria, P.A. immediately. Our experienced attorneys have the right expertise to fight for the compensation you deserve. Please call us for a free consultation. Attorneys Diana Santa Maria and Laura D. Dolin, personal injury attorneys in Fort Lauderdale, will fight to secure justice for you and your family. You can reach us at (954) 434-1077 or contact us via the website.